This article is about the TCG set. For the OCG set, see Duelist Pack: Legend Duelist. For the Duel Links character class, see Legendary Duelist. 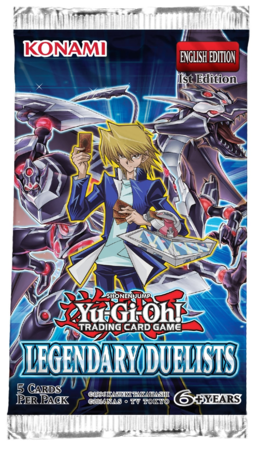 Legendary Duelists is a Booster Pack in the Yu-Gi-Oh! Trading Card Game (TCG). Includes cards used by Joey Wheeler, Mai Valentine, Mako Tsunami, The Big Five, Syrus Truesdale, Zane Truesdale, Bastion Misawa, Atticus Rhodes, Nightshroud, Tania, Broder, Yuya Sakaki, and Trout. Includes members and/or support for the "Amazoness", "Cyber", "Darkness", "Gearfried", "Kuriboh", "Red-Eyes", "roid", and "Vehicroid" archetypes, as well as the Chemical, Signature move, and with Chain series. Introduces the first support for the "Bonding" and "Cyberdark" archetypes to the TCG.